I love photographing pets of all kinds and I have the patience it takes to capture images you will treasure for a lifetime. I love environmental sessions where your pet is free to run and be posed with beautiful natural backdrops. I can also do studio style sessions with a variety of backgrounds and props. This is a traveling studio which can be set up in your garage or a large room in your home. I live in Tampa but my family is in Orlando and I am usually there 1 week out of every month or as needed for work. I have a working relationships with South Tampa Puppy Palace, Central Bark Doggie Daycare and DARE Dachshund Rescue in Tampa. I am always looking to link up with other pet based businesses and rescues! I will photograph your pet running, playing and just being themselves. I also make it a goal to get a fantastic portrait of you with your pet if you desire it. These sessions are best done at a place where the pet can be leash free at least part of the time. A long leash works as well as it can usually be easily edited out. I can come to your home or meet at a park. Packages now include fully edited/retouched PRINT Resolution* Photo files! I spend a good amount of time on the back end in both Lightroom and PhotoShop bringing out the detail in your pets fur/making the color pop/removing distractions etc. You are able to have your photos printed up to 11x14" with these files. Larger sized prints/canvas/wall art can be purchased directly from me for best quality. Session Price determined by how many final Print Resolution Photos you want. I will send you link to view gallery of best images on my site. Your choices are fully edited and retouched to look amazing-I bring out details in fur, pump up color etc. Black and White versions provided if desired no extra charge! * Print Resolution Files Print up to 11x14" Larger Prints/Canvas etc should be ordered directly from Stephaniellen Photography for best quality. -These sessions cost more because of the extra time it takes me to set up and break down my portable studio. I have a variety of backdrops and props to use during these sessions. These sessions work best with dogs who are good about staying in one place. Same package as above. If the price of an individual session is too much for you I can do shorter sessions with less final photos for groups of people and their pets. Gather 3-5 friends with their pets and I can meet you for 2 hours. We can arrange a special package just contact me for details.These shoots can be done at a home or local dog park/beach. 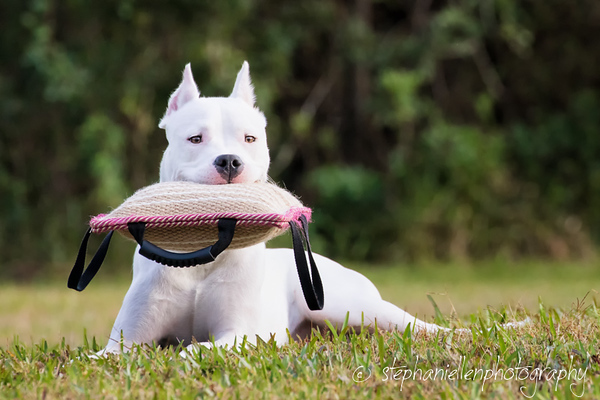 I work with Central Bark Doggie Day Care and South Tampa Puppy Palace and would love to also work with you! Christmas photos with Santa or other portraits throughout the year. Contact me for details!